The Affordable Care Act (ACA) not only significantly expanded access coverage starting in 2014, but also sought to improve access to services by reducing cost barriers to care and requiring coverage of certain “essential benefits”. For example, the ACA established patient annual out-of-pocket cost maximums; eliminated patient cost sharing for certain preventive care services; and prohibited annual and lifetime limits on benefits. The ACA expanded access to coverage primarily in the individual market through the Health Insurance Marketplace and by expanding Medicaid based on household income. Federal marketplace subsidies were also made available to consumers with incomes between 100% and 400% of the FPL who were not eligible for Medicaid or affordable employer-based coverage (i.e., coverage costing more than about 9.5% of the employee’s household income). Around 272,0005 Michigan adults signed up for federal marketplace plans during the first 2014 open-enrollment period, while 341,0006 signed up during the first 2015 open-enrollment period. Our findings show that since insurance has been expanded in Michigan under the ACA, cost-related barriers to care and delaying care have been reduced significantly. Thus, the ACA seems to have succeeded in reducing some barriers to accessing and affording health care. Now that changes in the Affordable Care Act are all but certain, it will be important to assess proposed approaches to coverage and care with the experience of the Affordable Care Act in mind so that the progress we see evidenced with these data is not erased. 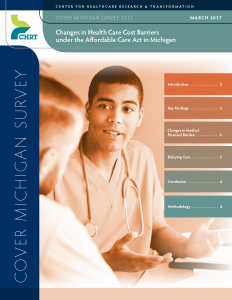 This brief presents findings on how health care access changed in Michigan with ACA implementation, using the Center for Healthcare Research & Transformation’s 2010, 2012, 2014, and 2015 Cover Michigan Surveys. During the first two years of ACA implementation, there was a significant and sustained drop in the proportion of Michigan adults who reported having trouble paying their medical bills. 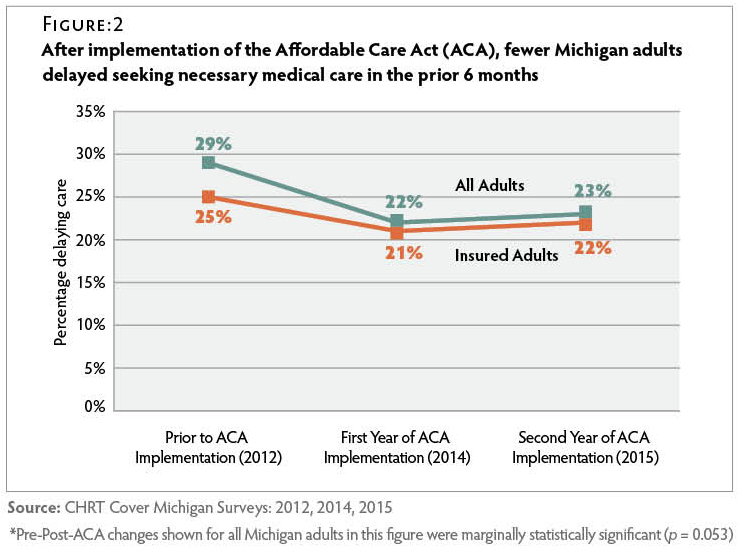 Fewer Michigan adults delayed seeking necessary medical care after ACA implementation. Prior to ACA implementation, among Michigan adults who delayed seeking necessary medical care in the previous six months, more than half cited cost concerns as reasons for delaying care. By the second year of ACA implementation, cost concerns had become less prominent, and convenience concerns (such as being too busy or not having time to go) were cited just as often as cost concerns among all Michigan adults, and more often than cost concerns among those with coverage. The proportion of Michiganders who reported having problems paying medical bills decreased significantly after the introduction of the ACA. In the second year of open enrollment, 19 percent of respondents reported problems paying medical bills during the previous twelve months, compared to 20 percent during the first year of open enrollment, and 27 percent two years prior to the implementation of the ACA. Figure 1 This represents an 8-percentage-point drop in the proportion of all Michigan adults having problems paying medical bills. Both before and after the ACA implementation, around one in six respondents had a household income below — or within a few thousand dollars of being below — 138% of the Federal Poverty Line (FPL) (adjusted by year and household size). The proportion of low-income Michigan adults did not significantly decrease over time, but there was a statistically significant 15-percentage-point drop in the proportion of low-income Michigan adults who reported having problems paying or being unable to pay medical bills. This reduction in medical financial burden is likely the result of more people gaining coverage, as well as increased financial protections for insured patients under the ACA, such as elimination of insurer lifetime and annual limits on benefits, and establishment of patient annual out-of-pocket cost maximums. Before the roll-out of the ACA in Michigan, cost concerns were cited by more than half of those delaying necessary care — even among the insured. Figure 3 Cost concerns included the perceived expense of seeking care or concern about the amount of copays and/or deductibles. When respondents were asked why they had delayed care during the first two years of ACA implementation, reasons related to cost decreased dramatically, with only about one in three citing them. 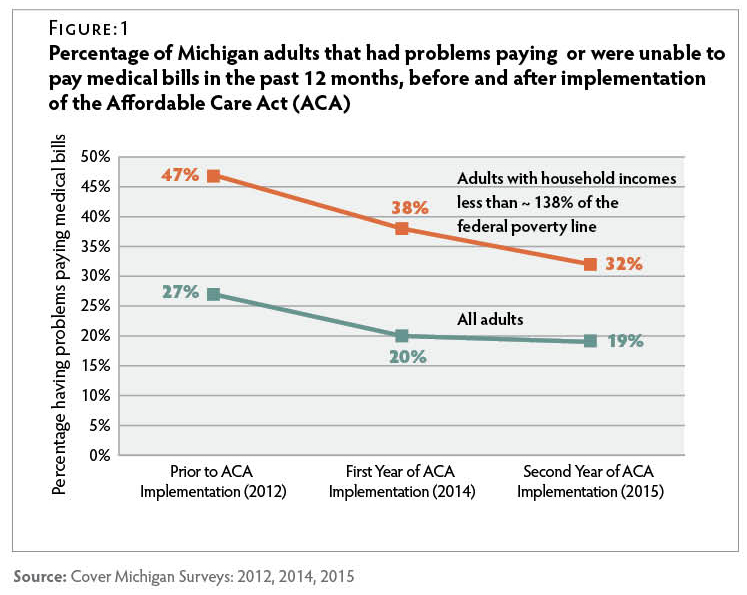 By the second year of ACA implementation, when respondents were asked why they had delayed care, approximately twice as many insured Michigan adults reported doing so due to convenience concerns as did before the ACA was introduced. Convenience concerns included not feeling like going, being too busy to go, and thinking one could get better on one’s own because the problem was not severe. 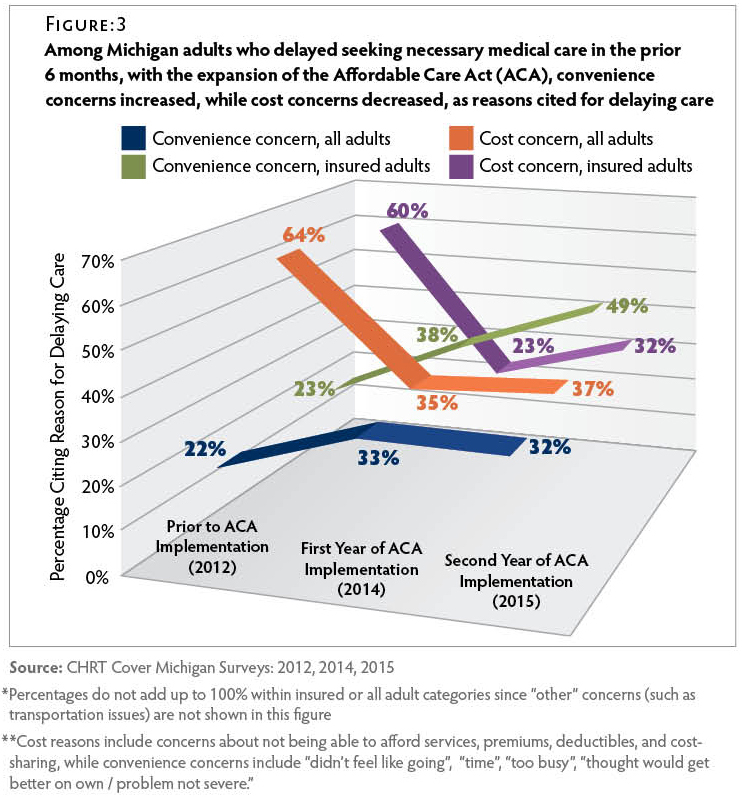 Although fewer respondents reported delaying seeking necessary care due to cost concerns in more recent years, cost issues — such as having trouble paying medical bills — remained a challenge for about one in five Michigan adults, as shown in Figure 1. Since the implementation of the ACA, far fewer Michigan adults are having trouble paying medical bills, and fewer are delaying seeking necessary medical care due to cost concerns. As the federal government looks to make what may be significant changes to this law, emphasis should be placed on continuing to reduce cost-related barriers to health care. The survey data presented in this brief were produced from a series of survey questions added to the Michigan State University Institute for Public Policy and Social Research (IPPSR) quarterly State of the State Survey. A full report of the IPPSR State of the State Survey methodology can be found at: http://ippsr.msu.edu/soss/. Acknowledgments: The staff at the Center for Healthcare Research & Transformation would like to thank Robert Goodman, Helen Levy, Sanjay Saint, Renuka Tipirneni, and the staff at the Institute for Public Policy and Social Research (IPPSR) at Michigan State University for their assistance with the design and analysis of the survey.